Over the years from its introduction Mapreduce technology proved to be very effective parallel programming technique to process large volumes of data. One of the most prevalent implementations of Mapreduce is Hadoop framework and Google proprietary Mapreduce system. Out of other notable implementations one should mention recent PGAS (partitioned global address space) – based X10, UPC (Unified Parallel C) versions. These implementations present a new viewpoint when Mapreduce application developers can benefit from using global address space model while writing data parallel tasks. 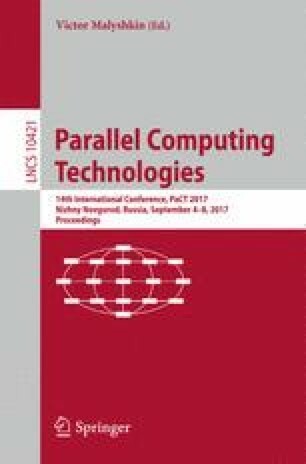 In this paper we introduce a novel UPC implementation of Mapreduce technology based on idea of using purely UPC based implementation of shared hashmap data structure as an intermediate key/value store. Shared hashmap is used in to perform exchange of key/values between parallel UPC threads during shuffle phase of Mapreduce framework. The framework also allows to express data parallel applications using simple sequential code. Additionally, we present a heuristic approach based on genetic algorithm that could efficiently perform load balancing optimization to distribute key/values among threads such that we minimize data movement operations and evenly distribute computational workload. Results of evaluation of Mapreduce on UPC framework based on WordCount benchmark application are presented and compared to Apache Hadoop implementation.